Exceptional Artisan Quality by Angel Ceron – crafted with care to be treasured for years to come. 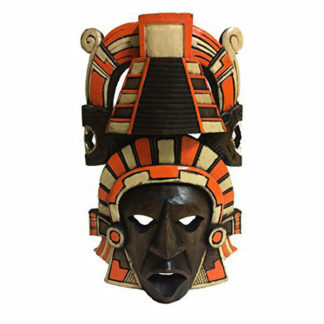 About this item: Celebrating Mesoamerica’s ancient cultures, Angel Cerón designs and creates an original mask based on a lifelong study of Mexico’s pre-Hispanic cultures. 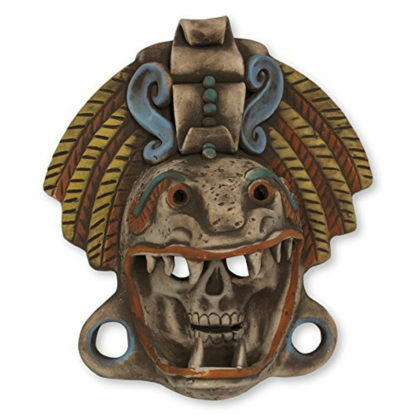 A stylized image of Quetzalcoatl, the Feathered Serpent, crowns a skeleton mask. The bony skull emerges from the fangs of a fierce cat. With his light hair and blue eyes, conquistador Hernán Cortés was thought by some Aztec soothsayers to be Quetzalcoatl himself. This facilitated the downfall of the Aztec empire. About our Artist: Angel Ceron comes from a family with generations of artisan experience. He learned the family ceramic techniques from his father, Antonio Ceron Orta, a renowned artisan. 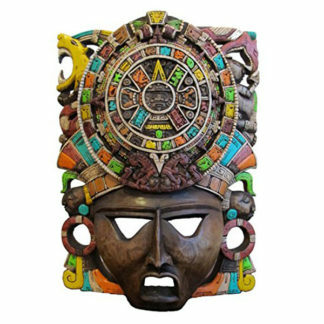 Angel began a long study of Mexico’s pre-Hispanic cultures and learned the Nahuatl language spoken in ancient Mesoamerica. He uses clay from northern Oaxaca state, the only clay of this kind in Mexico and perhaps in the world. The unique characteristics of this yellow clay make it ideal for his work.